Summary: The Merrimack River winds through New England on its way to the Atlantic Ocean. 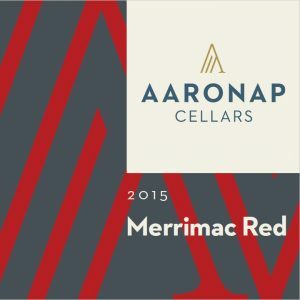 On the right bank sits Aaronap Cellars where we craft this fine example of a “Right Bank Bourdeaux” style red wine. We began our vintage painting with merlot from Mendocino, CA and then added layers of complexity by blending in cabernet franc, cabernet sauvignon, and petite verdot. A full-bodied dry red wine that brims with intense aromas of blackberry, dark cherry, cocoa, mint, & leather aromas. Dancing tannins linger on the finish and add a rich spiceyness. Aging Potential: Drink now through 2022. Food Pairing Suggestions: Excellent with a hearty meal of grilled steaks, kale & sausage soup, roast chicken, beef wellington, roast pork, or lamb. Aging Protocol: 18 months in a mixture of French & American oak barrels. Bottled aged for an additional 6 months. Due to low yields at our normal vineyard in Washington, we were forced to head south to find our merlot in the rich Iron Oak Vineyard of Mendocino, California. An almost perfect vintage resulted in grapes rich in flavor and balanced sugars and acidity. Fermentation with MT yeast was uneventful and the wine entered a 4 year old-French oak barrel. We moved further south to source our cabernet franc from the Suisun Valley in CA. The warmer southern valley resulted in higher sugar levels and lower acidity, which required a tartaric acid addition to balance. After fermentation with BDX, the cabernet franc was aged in Intellitanks to preserve the intense fresh fruit aromas. When the merlot was perfectly barrel aged, blending with the cabernet franc and a splash of cabernet sauvignon and petite verdot resulted in a perfect marriage of fresh fruit and dancing tannins.